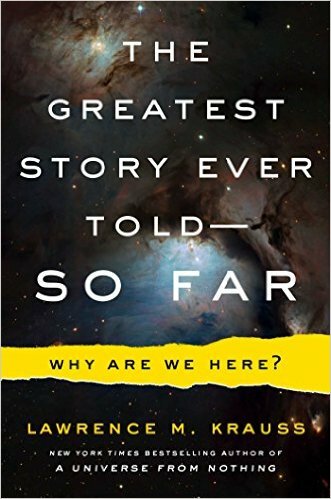 The Greatest Story Ever Told -- So Far: Why Are We Here? 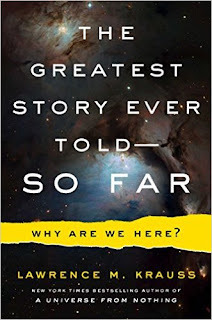 is an upcoming non-fiction book by Lawrence M. Krauss, a Canadian-American cosmologist and theoretical physicist. The book is scheduled to be published by Atria Books on March 21, 2017. The book is an off-shoot of a popular talk of a very similar title he delivered in various freethought conventions and university events. You can watch Krauss delivering the talk at the 2013 Oklahoma Freethought Convention (FREEOK) here [video uploaded by Seth Andrews of The Thinking Atheist channel]. So what is the book all about? Here's en excerpt from the official description for the book: "In a landmark, unprecedented work of scientific history, Krauss leads us to the furthest reaches of space and time, to scales so small they are invisible to microscopes, to the birth and rebirth of light, and into the natural forces that govern our existence. His unique blend of rigorous research and engaging storytelling invites us into the lives and minds of the remarkable, creative scientists who have helped to unravel the unexpected fabric of reality—with reason rather than superstition and dogma. Krauss has himself been an active participant in this effort, and he knows many of them well. The Greatest Story challenges us to re-envision ourselves and our place within the universe, as it appears that “God” does play dice with the universe. In the incisive style of his scintillating essays for The New Yorker, Krauss celebrates the greatest intellectual adventure ever undertaken—to understand why we are here in a universe where fact is stranger than fiction." The book has garnered praise from the likes of Elizabeth Kolbert, Penn Jillette, Martin Rees, Noam Chomsky, Walter Gilbert, and Frank Wilczek. Kolbert called the book "accessible, illuminating, and surprising". Jillette called it a "great book". Chomsky described reading the book as a "an exhilarating experience". And last but not the least, Wilczek describes the book as "intellectually serious and authoritative". 1. The Fifth Essence: The Search for the Dark Matter in the Universe (1989) - Krauss delves into what dark matter is and the role it plays in our mission to understand the universe and all of its workings. 2. Fear of Physics: A Guide for the Perplexed (1994) - This is an easy-to-read primer on the wonders of physics. Krauss offers answers in the form of anecdotes and examples to very common research questions relating to theoretical physics. 3. The Physics of Star Trek (1996) - Krauss wrote this book because he believed that he can get people to be interested in physics by using Star Trek as the subject material to discuss topics like warp drive, inertial dampers, teleportation, wormholes, pure energy beings, light speed, and time travel. As a bonus, the book also features an interesting foreword by the one and only Stephen Hawking. 4. Beyond Star Trek: Physics from Alien Invasions to the End of Time (1998) - This is an expansion of the ideas and concepts that Krauss delved into in his previous book, The Physics of Star Trek. 5. Quintessence: The Search for Missing Mass in the Universe (2000) - This is an updated version of of Krauss's 1989 book The Fifth Essence. 6. Atom: An Odyssey from the Big Bang to Life on Earth...and Beyond (2001) - Krauss explains in layman's terms the history of the universe starting from the formation of oxygen atoms that became the primary atoms in the Big Bang. 7. Hiding in the Mirror: The Mysterious Allure of Extra Dimensions, from Plato to String Theory and Beyond (2005) - Krauss delves into the scientific and cultural aspects of extra dimensions. He explores topics like string theory, life in other dimensions, and black holes. 8. Quantum Man: Richard Feynman's Life in Science (2011) - This work which was given the Book of the Year award in 2011 by Physics World is Krauss's tribute to Richard Feynman, one of the most influential scientists that the world has ever known. The book contains a lot of intriguing anecdotes and insights about the celebrated scientist. 9. A Universe from Nothing (2012) - Although this book was widely panned by philosophers and physicists, it's undoubtedly Krauss's most popular book. The book is an expansion of material from a lecture Krauss wrote. A Universe from Nothing features an afterword by Richard Dawkins. The late Christopher Hitchens was supposed to write the foreword but he was too ill to write the text on time.